I’ve written a couple of posts about the Emotiv EPOC over the years of doing the blog, from user interface issues in this post and the uncertainties surrounding the device for customers and researchers here. The good news is that research is starting to emerge where the EPOC has been systematically compared to other devices and perhaps some uncertainties can be resolved. The first study comes from the journal Ergonomics from Ekandem et al and was published in 2012. You can read an abstract here (apologies to those without a university account who can’t get behind the paywall). These authors performed an ergonomic evaluation of both the EPOC and the NeuroSky MindWave. Data was obtained from 11 participants, each of whom wore either a Neurosky or an EPOC for 15min on different days. They concluded that there was no clear ‘winner’ from the comparison. The EPOC has 14 sites compared to the single site used by the MindWave hence it took longer to set up and required more cleaning afterwards (and more consumables). No big surprises there. It follows that signal acquisition was easier with the MindWave but the authors report that once the EPOC was connected and calibrated, signal quality was more consistent than the MindWave despite sensor placement for the former being obstructed by hair. This entry was posted in Research and tagged BCI, eeg, emotiv, P300, user evaluation on July 24, 2013 by Steve Fairclough. With regards to the development of physiological computing systems, whether they are BCI applications or fall into the category of affective computing, there seems (to me) to be two distinct types of research community at work. The first (and oldest) community are university-based academics, like myself, doing basic research on measures, methods and prototypes with the primary aim of publishing our work in various conferences and journals. For the most part, we are a mixture of psychologists, computer scientists and engineers, many of whom have an interest in human-computer interaction. 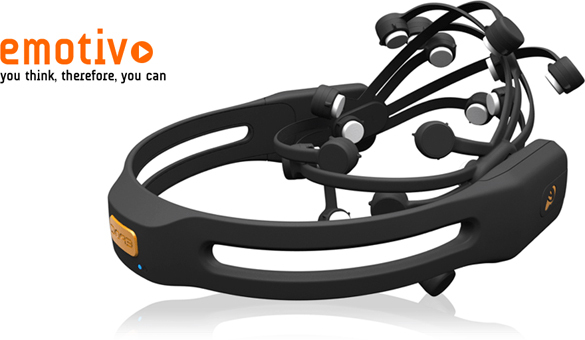 The second community formed around the availability of commercial EEG peripherals, such as the Emotiv and Neurosky. Some members of this community are academics and others are developers, I suspect many are dedicated gamers. They are looking to build applications and hacks to embellish interactive experience with a strong emphasis on commercialisation. There are many differences between the two groups. My own academic group is ‘old-school’ in many ways, motivated by research issues and defined by the usual hierarchies associated with specialisation and rank. The newer group is more inclusive (the tag-line on the NeuroSky site is “Brain Sensors for Everyone”); they basically want to build stuff and preferably sell it. This entry was posted in Musings, Research and tagged affective computing, eeg, emotiv, Neurosky, physiological computing, user evaluation on June 7, 2012 by Steve Fairclough. This week see’s the release of the talks presented during the Sharing the Physiological Experience session. To view these talks and more please click here. For guidance about the session 4 talks please consult the abstracts listed below. This release marks the end of the CHI 2011 Brain and Body Designing for Meaningful Interaction workshop videos. I’d like to thank our presentators for allowing us to share their talks on the Internet and for choosing our workshop to present their research. Without you the workshop could not of been the success it was. Hopefully these videos will go some small way to bringing your excellent research to a wider audience, and if not they can always be used to explain what exactly you do to family and friends. This entry was posted in News and tagged bbiCHI2011, biofeedback, body blogs, eeg, ethics, loneliness, multiplayer games, music, security on June 21, 2011 by Kiel Gilleade. While CHI2011 maybe over we’re still a while away before the bbiCHI2011 workshop can officially wrap-up. For the next four weeks we’ll be releasing the videos we took of the presentated papers (see here for the full list). This week see’s the release of the opening talk Introducing Meaningful Interaction presented by Stephen Fairclough and the three talks presented during the Input Control session. To view all four talks please click here. For guidance about session 1 talks please consult the abstracts listed below. This entry was posted in News and tagged bbiCHI2011, eeg, ern, erp, grasp, Neurosky, talk on May 24, 2011 by Kiel Gilleade. I just watched a TEDMED talk about the iBrain device via this link on the excellent Medgadget resource. The iBrain is a single-channel EEG recording collected via ‘dry’ electrodes where the data is stored in a conventional handheld device such as a cellphone. In my opinion, the clever part of this technology is the application of mathematics to wring detailed information out of a limited data set – it’s a very efficient strategy. The hardware looks to be fairly standard – a wireless EEG link to a mobile device. But its simplicity provides an indication of where this kind of physiological computing application could be going in the future – mobile monitoring for early detection of medical problems piggy-backing onto conventional technology. If physiological computing applications become widespread, this kind of proactive medical monitoring could become standard. And the main barrier to that is non-intrusive, non-medicalised sensor development. In the meantime, Neurovigil, the company behind the product, recently announced a partnership with Swiss pharmaceutical giants Roche who want to apply this technology to clinical drug trials. I guess the methodology focuses the drug companies to consider covert changes in physiology as a sensitive marker of drug efficacy or side-effects. This entry was posted in News, Research and tagged body blogs, eeg, telemedicine, wireless on June 17, 2010 by Steve Fairclough. 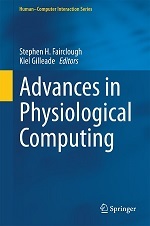 Like a lot of people, I came to the area of physiological computing via affective computing. The early work I read placed enormous emphasis on how systems may distinguish different categories of emotion, e.g. frustration vs. happiness. This is important for some applications, but most of all I was interested in user states that related to task performance, specifically those states that might precede and predict a breakdown of performance. The latter can take several forms, the quality of performance can collapse because the task is too complex to figure out or you’re too tired or too drunk etc. What really interested me was how performance collapsed when people simply gave up or ‘exhibited insufficient motivation’ as the psychological textbooks would say. People can give up for all kinds of reasons – they may be insufficiently challenged (i.e. bored), they may be frustrated because the task is too hard, they may simply have something better to do. The prediction of motivation or task engagement seems very important to me for biocybernetic adaptation applications, such as games and educational software. Several psychology research groups have looked at this issue by studying psychophysiological changes accompanying changes in motivation and responses to increased task demand. 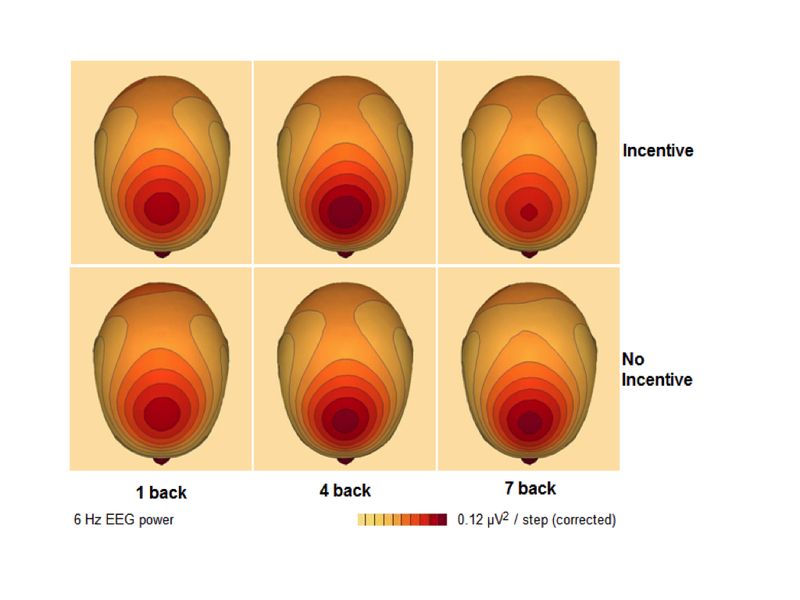 A group led by Alan Gevins performed a number of studies where they incrementally ramped up task demand; they found that theta activity in the EEG increased in line with task demands. They noted this increase was specific to the frontal-central area of the brain. We partially replicated one of Gevins’ studies last year and found support for changes in frontal theta. We tried to make the task very difficult so people would give up but were not completely successful (when you pay people to come to your lab, they tend to try really hard). So we did a second study, this time making the ‘impossible’ version of the task really impossible. The idea was to expose people to low, high and extremely high levels of memory load. In order to make the task impossible, we also demanded participants hit a minimum level of performance, which was modest for the low demand condition and insanely high for the extremely high demand task. We also had our participants do each task on two occasions; once with the chance to win cash incentives and once without. The results for the frontal theta are shown in the graphic below. You can clearly see the frontal-central location of the activity (nb: the more red the area, the more theta activity was present). What’s particularly interesting and especially clear in the incentive condition (top row of graphic) is that our participants reduced theta activity when they thought they didn’t have a chance. As one might suspect, task engagement includes a strong component of volition and brain activity should reflect the decision to give up and disengage from the task. We’ll be following up this work to investigate how we might use the ebb and flow of frontal theta to capture and integrate task engagement into a real-time system. This entry was posted in Research and tagged eeg on January 24, 2010 by Steve Fairclough.